It is unclear if the Scottish Deerhound was once identical with the Irish Wolfdog. Many names were used to describe the purpose of the dog instead of the species. Those names included, but were not limited to, Irish Wolf Dog, Scotch Greyhound, Rough Greyhound and Highland Deerhound. The breed could definitely be identified as Deerhounds as early as the 16th or 17th century. 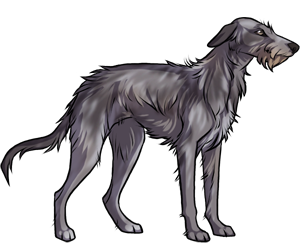 Their main purpose was pursuing and killing deer, hence the name Deerhound. The Scottish Deerhound was first registered in the AKC in 1886. -The Scottish Deerhound breed became so prized that exclusive ownership became a priority, imposing breeding privileges. At one point, the breed almost became extinct because of these policies. -At one point in history, no one of rank lower than an earl might possess a Scottish Deerhound.